Today I'm going to address three topics that are common among cat parents, including myself, with some simple solutions or ideas on how to keep the whole family in balance at the same time. Simon making his Puss In Boots face! When we rescued Simon a few years back, he had a problem with little Rocky. I talked about it in a Previous Cat Talk Post. At that time, Simon was attacking Rocky and it even resulted in some scratches. In fear of Simon ripping Rocky's eye out, kitty received regular nail trimmings and SoftClaw applications. Since this past winter, peace has been restored in the house, no more SoftClaws for Simon, and he now just gets regular nail trims. 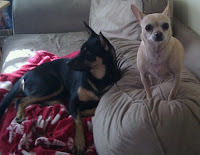 He no longer attacks Rocky, but not because he fell in love with him, its because we rescued Shirley, a dog who wouldn't stand for anyone being mean to anyone else in her pack. There are many other instances where your cat child may be causing doom and gloom with her claws. Many cats kneed on furniture or even scratch up the entire house. It is also not uncommon in the world of rescuing animals, to encounter feral or non-feral cats who just want to claw the crap out of you! Declawing is NEVER the answer. SoftClaws and similar nail covers is a better and more humane alternative. 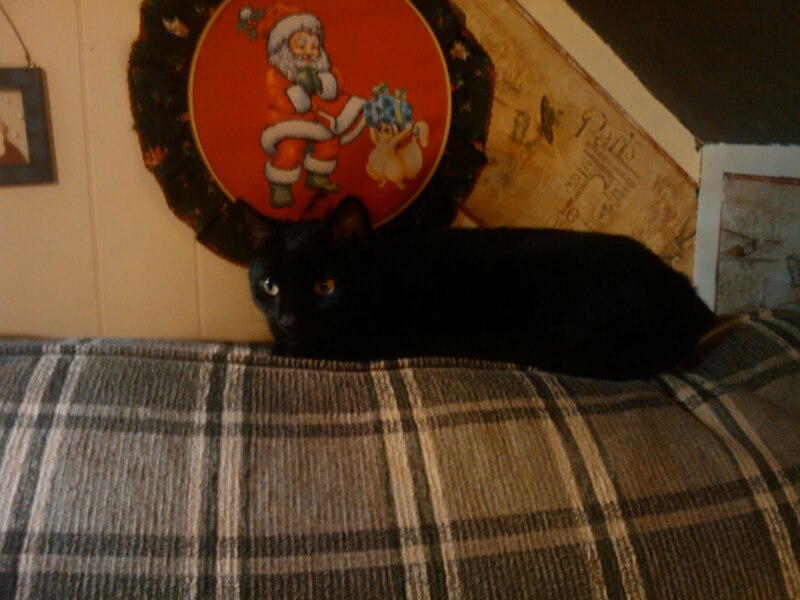 Thankfully it was temporary in my household and since, the canines and felines created their own boundaries and territories. I really didn't have to do too much there. However, if your fur children aren't making their own space and separating themselves, you may want to create a space for each, in which they feel comfortable and safe. It takes time and is trial and error, but eventually peace should be restored. Offering scratching posts, lots of toys and play/ stimulation, is also always a great idea. There are always issues when it comes to litter. The mess, the strong fragrance, the way your cat reacts to litter, if your cat favors a particular brand or not, and so on. There is also the potential harm to your cat's health and the environmental impact to think about. A lot of clay-based litters that contain perfumes and other chemicals are risky for cats, especially since cats are such keen groomers and are prone to ingesting these chemicals. Alternatives are fragrance free litters or natural pellet and pine litters. I've heard a rumor that the small natural company that owns Feline Pine, has been bought by Arm & Hammer. I am still researching this, but if this is true and A&H is still testing in animals, then obviously Feline Pine would not be a vegan-friendly recommendation However there are many other natural litters available, and other pine products. Another perk of using clay-free litters is that you don't have that dust cloud when you are pouring litter into the box. That is kind of gross. Whether your cat child is a short haired breed or long haired breed, chances are you're dealing with fur everywhere. Embedded in your rugs, on your furniture and clothing, and even clumps slowly breezing by like tiny tumbleweeds. Well, regular brushings help keep everything under control, and also will create a bond between you and kitty. Also, some groomers have a brush that trims a little while it brushes, if your cat is very fury. For rugs and such, I notice that a hard bristle broom (plastic bristles work great) will get the hair unstuck. Just sweep as usual, applying firm pressure to your rug and sweep into a dustpan. You may also want to use a small handheld sweeper. I usually take Simon's fur from the rugs and brushes and put them outside in the yard for the wildlife to make nests with. Its always funny to see nests made with an array of materials, including your cat's old rug fur! It must keep the birds, squirrels, chipmunks, and other wildlife nice and warm in the fall and winter months. Not to mention it must make a soft and comfortable home for them. Do you have any neat animal companion tips or stories? Yes, Another Veg-friendly Chain Restaurant! I'm happy to report yet another vegan friendly restaurant that not only will accommodate us veggie folk, they have vegan dishes on the menu now! No, I'm not kidding you. And yes, I realize this is unusual for chain restaurants, some of which still do not offer a simple veggie burger on their menu. 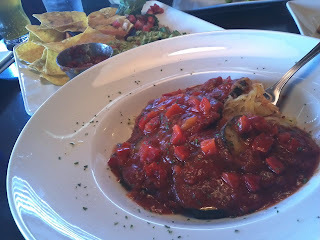 Well, Ruby Tuesday has lots of veggie options. Like what, you ask? Its not just about the salad bar anymore (which is not too shabby either); you can actually get other things. They make veggie sliders which are like little mini veggie burgers, which are off and on their menu that changes frequently. Right now, they are offering a lot of farm fresh veggie dishes on their menu. They have a lunch and dinner portion of the above picture, which is their Spaghetti Squash marinara (a vegan item on their menu - just be sure to say no fresh cheese on top because some staff may put some on top, although it is not mentioned on the menu, it can happen), that is like pasta but with the strings of squash instead, and has chunks of tomato, green zucchini, and onions in the sauce. It tastes pretty amazing too! They also offer a Veggie Trio dish where you choose three vegetarian sides that are on their menu. In addition to the plethora of produce to choose from in the salad bar, you may also want to start with their salsa, and fresh guacamole chips appetizer. It is portioned like a mini meal (very generous size) and I'm told there is no sour cream or dairy in the guac, which is pretty obvious anyway. This restaurant is among the best chains for accommodating vegetarian customers. So I definitely recommend it. You may want to call in advance, since they do change their menu items so often, and especially since autumn is approaching. I'm not sure what they will be offering for the upcoming season, but am excited to find out. 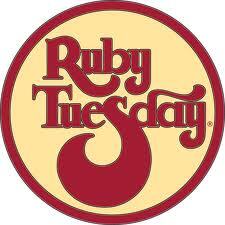 Ruby Tuesday, please keep the veggie menu items coming - we love it! And for now, the Dirty Vegan is signing off. My birthday is this week. I plan on eating plenty of vegan cake (and pretty much anything else I want - doesn't seem out of the ordinary at all actually). In honor of this joyous occasion, I have decided to start the annual Dirty Awards. These are the products that keep a gal being Naughty, because you know I wouldn't be able to do it without a little help. Only few earn this prestigious award, so you should feel honored happy. Let the Dirties begin! ...well at least we are humorous like the Dundies and not pretentious too formal about our awards here at the Dirty Vegan. It is about having fun and not taking yourself life too seriously. Congratulations to this year's award recipients! You have received recognition on this esteemed blog and the title as one of the Dirty Vegan's Enablers Favorite Foods/ Products! I would like to once again congratulate the winner's of this distinguished award. When choosing my Naughty products there are a lot to choose from out there, but I chose you. Consider yourself lucky awesome. It takes a team of excellence to make this Dirty Vegan (fake cheesy stuff and anything that's NOT fat free). This concludes this evening's Dirty Awards. Drive home safely. Stay Dirty. Salutations. And for now, the Dirty Vegan is signing off. Happy Birthday to Me! The last month of summer always reminds me of the next approaching season. I start to get so anxious for autumn, that I tend to make summer dishes and sides that are fall-ish. This recipe encompasses some ingredients that you would use early fall into the winter holidays, while still hanging onto summer. Its the best of both enjoyable seasons! Add all ingredients in a microwave safe baking dish and mix together. Cook in microwave oven for 10 minutes. Stir. Cook for an additional 2 minutes if necessary. Cooking times may vary depending on your microwave oven (or if you choose to use a regular or toaster oven instead), so you may want to play around with it when making this recipe the first time. Enjoy! I had this with brown rice and garlic roasted tofu. Yum! Let's face it, if you are vegan like me (I've encountered plenty of this for almost a decade), or even vegetarian, you have experienced the "going out to eat crisis". Oh no, your friends, family, co-workers, etc. want to go out to eat with you but they are stressing out because you are vegetarian. Over ten years ago I was stressing out a little too, and that was just as a vegetarian, however being vegan sometimes makes it a little more difficult because restaurants seem to sneak dairy, eggs, and honey into the unlikeliest places. However, now the options are much different for vegan dining. I know a lot of us tend to dine with our veggie partners or friends and seek out veg-friendly restaurants, but today I have yet another discovery of veg-friendliness in an unexpected place; you will be pleasantly surprised. 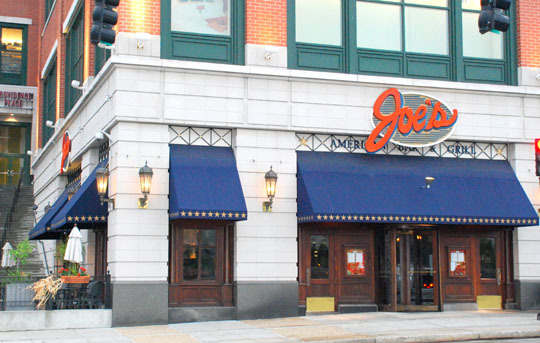 Joe's American Bar & Grill has many locations around the United States. I had the pleasure of dining at the Providence Place location in the heart of Providence, RI. 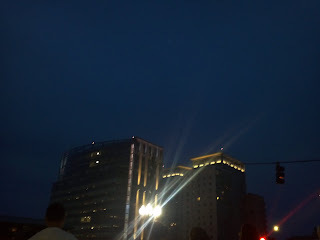 WaterFire was happening and the city was filled with personality. Joe's is located right across from WaterFire, making it a great place to eat if you plan to see the show or partake in a romantic gondola ride. 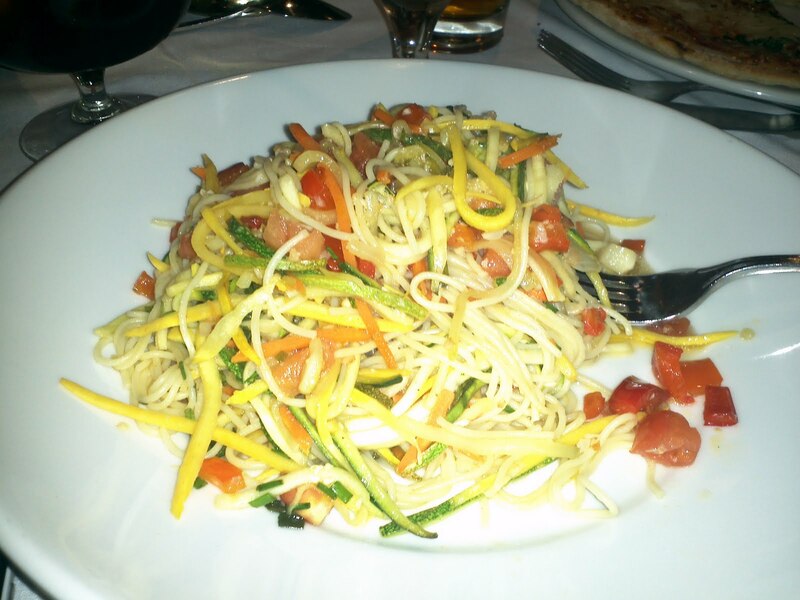 This gorgeous picture is of their Angel Hair Pasta Primavera. Just ask for it vegan with no cheese, because they normally do the vegetarian dish with Parmesan. 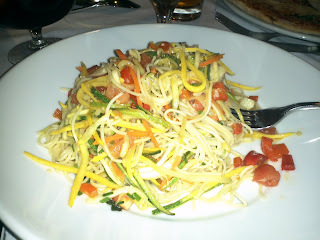 This angel hair dish was extraordinary including fresh ingredients such as zucchini, squash, tomatoes, red peppers, basil, garlic, oil, and lemon. The flavor combinations were especially pleasing to the palate, making this primavera much better than the usual options for vegetarians at restaurants. We also had nachos to start, which were made vegan with guacamole, salsa, and veggies. 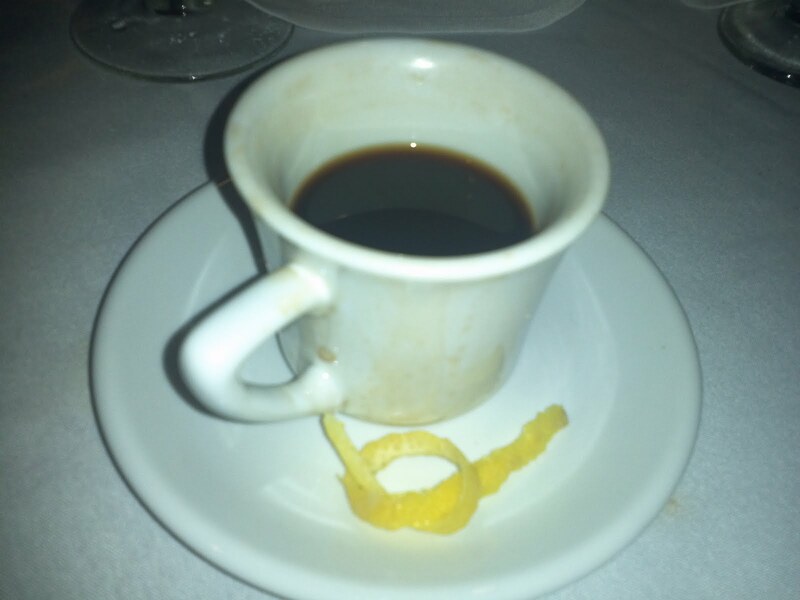 I ended my meal with a nice black espresso, which was rich and had a great quality taste. 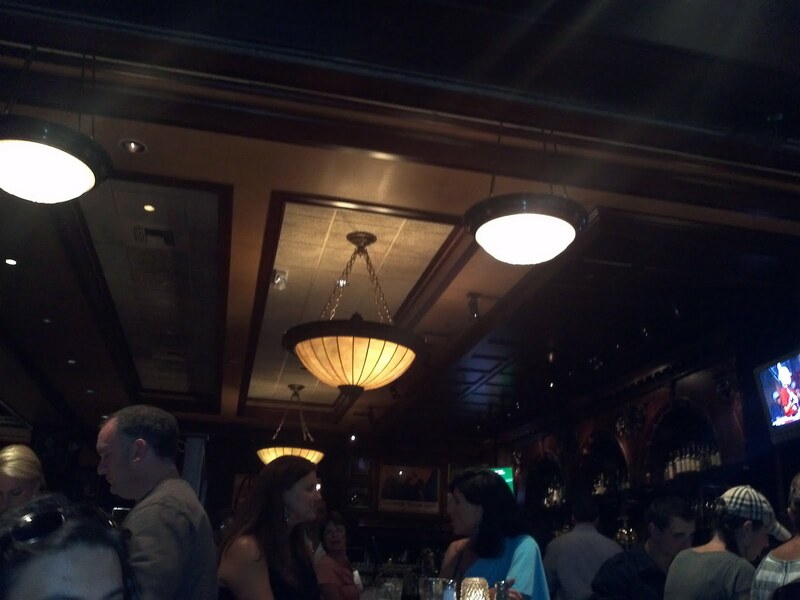 Joe's American Bar & Grill is a cosmopolitan of cuisine that works out great for everyone you may be dining with. We all know that it is highly unlikely that your entire family, friends, and social network are vegan, so it is great to find a place where you don't have to have menu anxiety and can go out and dine with others. Places like Joe's also deter you from the inevitable and awkward vegetarian conversations, with the menu versatility and atmosphere. You can order pizza with no cheese and just oil, tomato sauce, and veggies of your choosing, and many other options that are available upon request. Actually, quite a few of their menu items can be made vegetarian easily, especially since they do a lot of fresh dishes which aren't pre-made like some other eateries might do. This makes Joe's a five star with their accommodating factors. The surroundings were pretty cool also. We had delightful sidewalk seating, directly on Providence Place. Our view was of beautiful buildings on a wonderful summer evening. The energy from WaterFire was nice also and you could even hear music from the show. 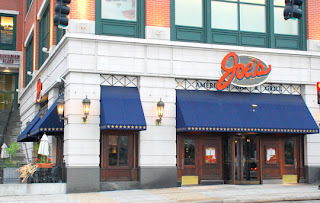 The staff at Joe's American Bar & Grill were friendly and personable, even for an uber busy weekend night when the establishment and city were jam packed with crowds. The wall out front of Joe's opens and you can see inside from the sidewalk seating. The atmosphere was cool and fun! The next time you are in Providence, do not overlook fine American cuisine like that of Joe's American Bar & Grill. They are definitely down with the vegetarians and vegans! I had a meeting in a beach town. It was a gorgeous day outside; sunny and bright with a nice summer breeze. I put on a pair of preppy plaid short-shorts, tucked in a crisp white fitted button down, put on a cute pair of sandals to showcase my tropical pedi, and accessorized with a cute belt and pair of sunglasses. The day was starting out great. I was driving along and realized my vehicle was running out of gas. I stopped at a station close to where my meeting was located. Something compelled me to pull up to a pump that was kind of out of the way. I get out of the car and go around towards the station and something on the ground quickly caught my attention. There was a pile of dead starfish on the ground. I almost had to pinch myself; nothing these days should shock me, although they always do. There was a rock near them and it appeared that the starfish had been smashed to death. They were all dried out, bloody, and hard. I had to double check to be sure. One of the starfish appeared to be alive. I now have a rescue situation on my hands. I got myself into rescue mode and thought quickly. I don't know how long Starfish has been out here, but judging by the others, I knew I didn't have much time. I ran into the gas station's convenience store. I tell the attendant and ask for a container with water so that I can get this starfish in some water and figure out my next step. I was told that they didn't have anything to give me. At that point, I started becoming cynical and disappointed in my fellow humankind, as I so often do. For one, someone did this to these starfish, and two, no one was helping me. I quickly grabbed supplies and pay for them. I bought a foam cooler and room temperature bottled waters; complaining to the attendant the entire time while I was checking out, on how terrible I think it is that they allow people to abuse animals outside of their business and do nothing about it. I asked them to look at the surveillance tape and do something about this. I was cashed out and dashed back outside to Starfish. Two gentlemen who had overheard me inside the store, helped me outside. Whether they were helping the girl in short-shorts or helping the starfish, I was glad to receive assistance and was grateful. I was feeling a little better about my fellow mankind, but not much. We gently got Starfish into the cooler and I was almost certain Starfish was still alive. I thanked my helpers and quickly sped off. I controlled the temperature in my car with some A/C and some fresh air from the windows. It was comfortable and I was hoping it was okay for Starfish too. I arrived at my meeting, explained I had a rescue starfish in my car, met, and was out of there in a matter of minutes. I then head off to the beach, which was not far at all - literally three minutes, perhaps. I arrive at the beach and explain my discovery to the attendant at the booth. He let me park and didn't even charge me for it. Regaining my faith in fellow humankind...slowly. I clutch the foam cooler containing Starfish, and powerwalk to the beach. I come across a lifeguard and told him what I was doing. He pointed me in the right direction to the best place to release the starfish, which was a far edge of the beach, full of rocks and seaweed and no humans to disturb this starfish. I thanked him for his assistance and zoomed over to the quiet spot of the beach. I happen to know that if you place a starfish upside-down in water and it is alive, it will quickly right itself. I kneel down and notice that the current is kind of strong as waves come splashing into the rocks. For a second I feel like I should bring Starfish home to rehabilitate and then release in a few weeks. However, I don't know what starfish eat and have no idea how to properly care for one. The lifeguard did mention earlier that starfish heal themselves very quickly and can even regenerate lost limbs. Starfish only had some scrapes, so I decide to carry on with the release. I place Starfish upside-down in the ocean and wait. Starfish was still. I began to worry that Starfish didn't make it or that maybe Starfish was too weak to right itself. Then, just like a miracle, Starfish did a sort of wiggle flip-over thing. Starfish was right-side up. I worried about the current, but then watched as Starfish swam against the current into the ocean! It was a funny type of swimming I've never seen before. I didn't even know that starfish swim like that. It was very slow and gentle, almost like a glide. I now knew Starfish was strong enough to swim into the ocean against the waves splashing in, and make it look like a simple task to boot! I knew for sure Starfish would be okay. I felt better. I felt happy for Starfish. Although, I also felt sad for the others that had died at that gas station. I drove away from the beach feeling much different than when I had first arrived. When I found the pile of starfish, I was deeply saddened and sickened by what people can do to other living beings. I see it all the time being a vegan and animal rights activist, but I never get used to it. It never gets any easier to handle, but I do work harder and with a sense of urgency everyday. No creature is too small to be respected, loved, or saved. Of coarse, even starfish deserve a chance to live out their lives unharmed. Isn't that a given? After meeting people who cared about my mission to save Starfish, and especially after hearing the beautiful story of caring and determination afterwards, I felt renewed. I drove off admiring the sky, the beach air, and the ocean - feeling good about the fate of Starfish, feeling good about my life's mission, and feeling good about those fellow compassionate mankind who have it within themselves to care. And for now, the Dirty Vegan is signing off. Always Share Your Vegan Desserts!